Nestled in the woods next to a serene lake sits a beautiful new log cabin constructed by Gastineau Log Homes. This 60 acre property is in beautiful Lonedell, MO. Foam Engineers was brought in to spray open cell foam insulation on the upper level and the walkout basement of the cabin. 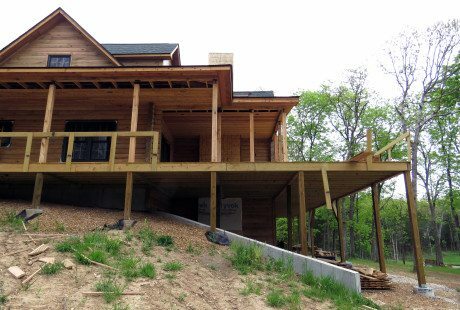 The main floor of this structure is built with solid oak logs requiring no insulation. 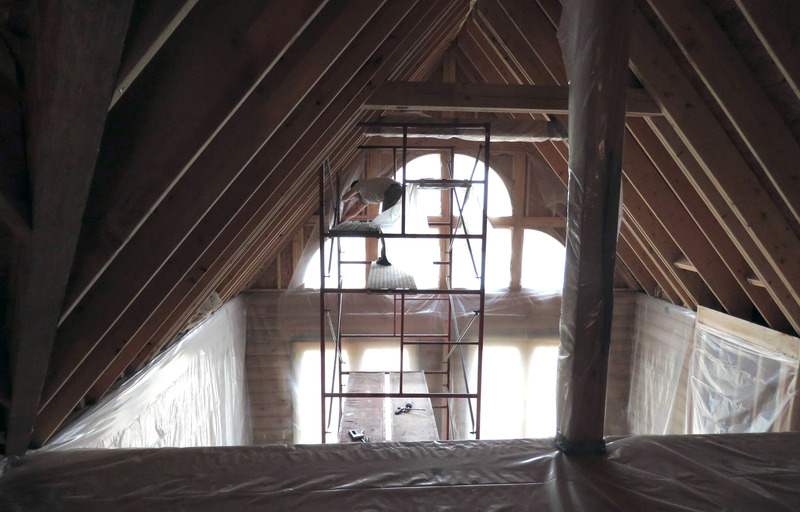 Open cell spray foam insulation was applied to dormer and gable end walls to insure maximum comfort for guests staying in the upper level. 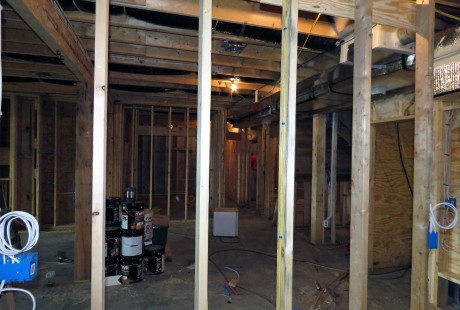 The basement bedrooms and baths, as well as the family room were also insulated with open cell spray foam. 3.5” of R13 open cell spray foam is applied to the gable walls expanding and filling small spaces ensuring less air will leak. With so much of the living space open, the R30 open cell spray foam is the right choice to ensure comfort throughout the cabin. 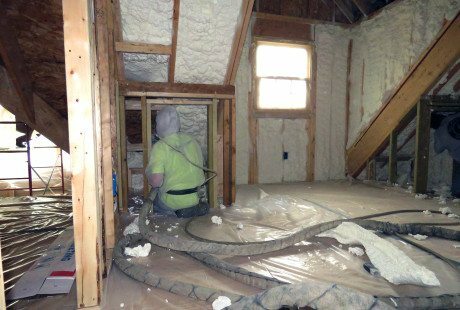 While open cell spray foam provides a comfortable atmosphere in which to relax and enjoy “getting away from it all”, the utility cost savings will undoubtedly have the same effect! 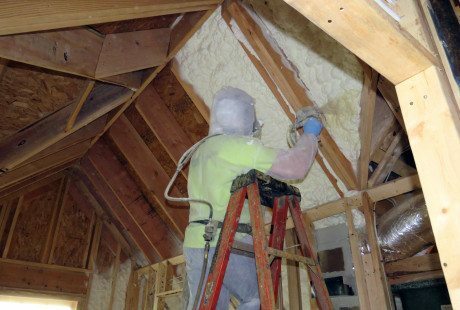 Open cell spray foam insulation has significantly less air leaks meaning a smaller, more efficient HVAC unit can be chosen and it won’t have to work so hard to keep the cabin comfortable. Open cell spray foam is applied to the underside of the roof sheathing. 8.5" of open cell spray foam insulation is applied. 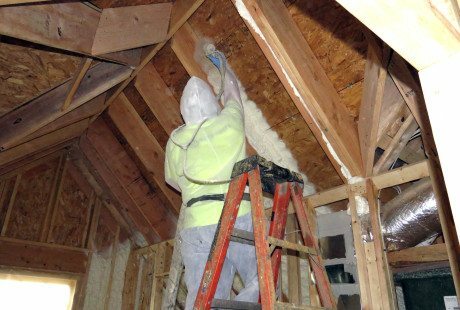 The Foam Engineers’ crew covering exposed oak on the job site before the spray foam application. 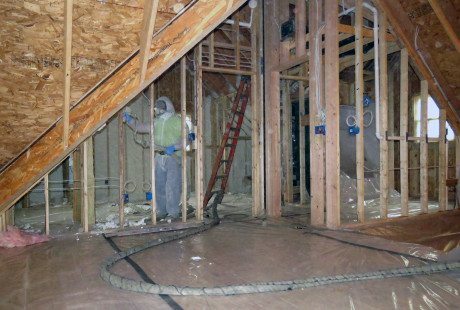 R19 open cell spray foam was chosen to maximize the comfort of the walkout basement level. Upper and lower levels of the cabin were insulated with R13, R19 and R30 open cell spray foam insulation to ensure maximum comfort. 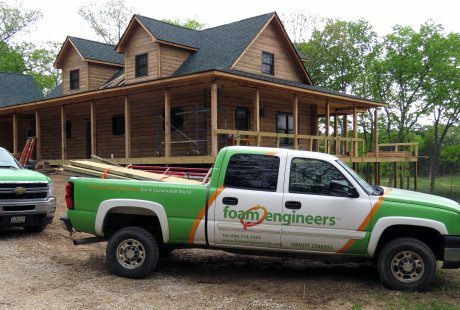 Foam Engineers applies open cell spray foam insulation in family vacation cabin on a 60 acre property in Lonedell, MO. 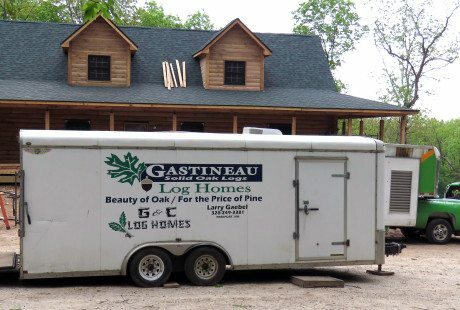 Gastineau Log Homes is the world¹s largest producer of Oak log homes and has been in business since 1977. They provide a fully engineered and proven construction system that will give a lifetime of trouble free enjoyment.